One New Aftermarket Replacement Intake & Exhaust Manifold that fits John Deere 2010 Gas Tractors. PLEASE NOTE: Does NOT come with Gaskets. We have the Gasket Sets available if you need them. Part Numbers T13384, AT12461, AT22610. Only the 48 contiguous States in the U. 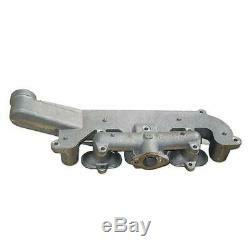 The item "John Deere 2010 Gas Tractor Intake & Exhaust Manifold AT12461 AT22610 T13384" is in sale since Saturday, December 29, 2018. This item is in the category "Business & Industrial\Heavy Equipment, Parts & Attachments\Heavy Equipment Parts & Accessories\Antique & Vintage Equipment Parts". The seller is "stevenslake" and is located in Williamston, Michigan. This item can be shipped worldwide.